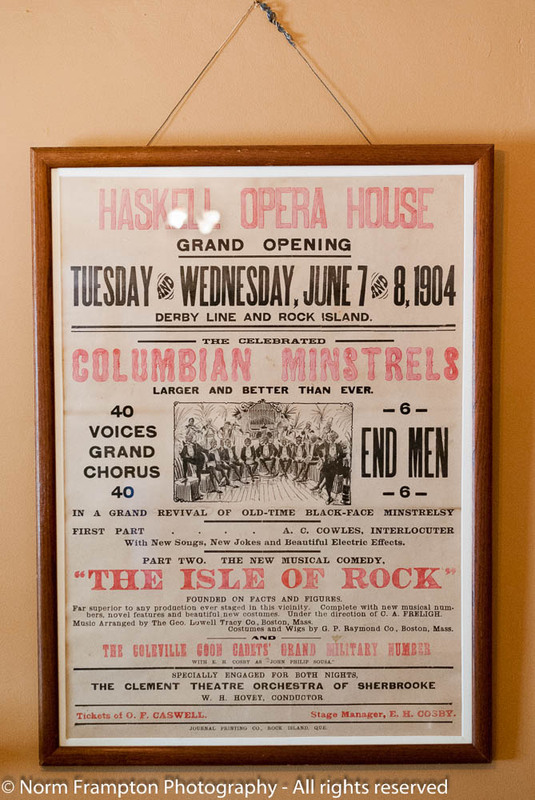 Opened in 1904 the Haskell free library and opera house was deliberately built on both sides of the Canada-U.S. border as a tribute to the spirit of friendship between the two countries. 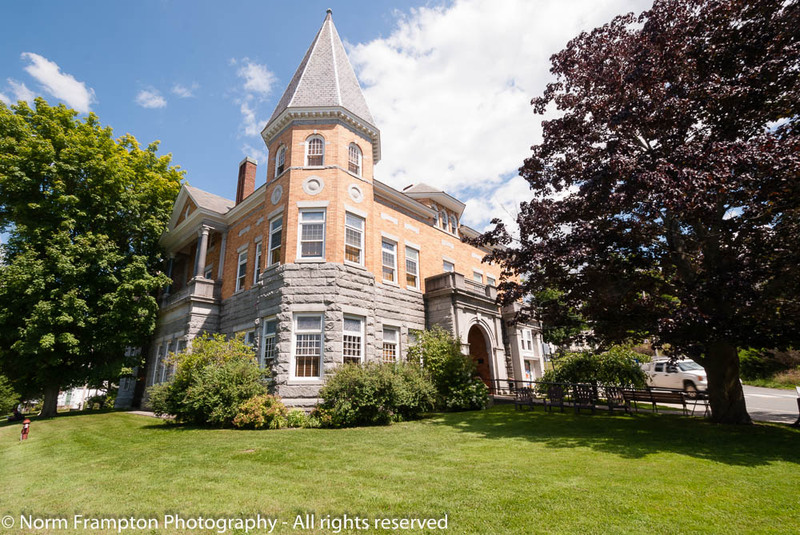 Setting up a shared library and opera house between the sleepy little border communities of Derby Line, Vermont and Stanstead, Quebec was the brainchild of Canadian Martha Stewart Haskell. 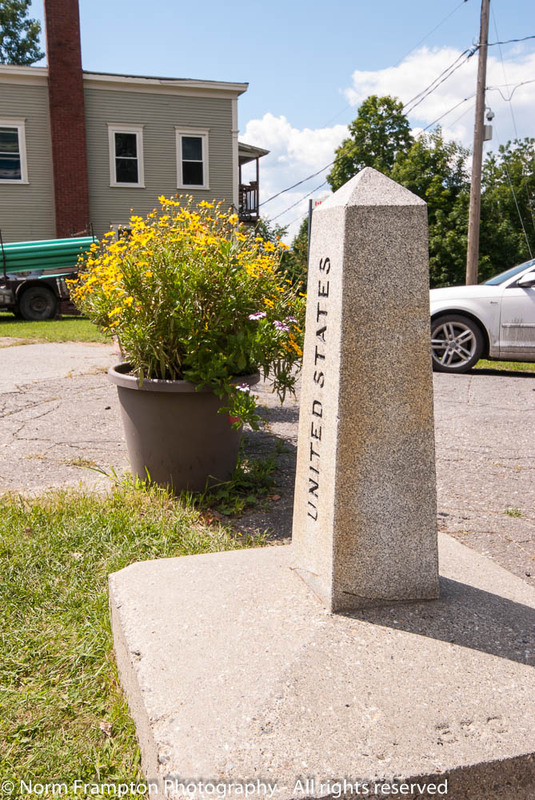 It was meant not only to honour her late husband, American sawmill owner Carlos Haskell, but to further cement the bond between neighbors in both towns. Over the years these two little communities had become so intertwined that today they share firetrucks, water and sewer systems, and there are many bi-national bloodlines among the families that live there. 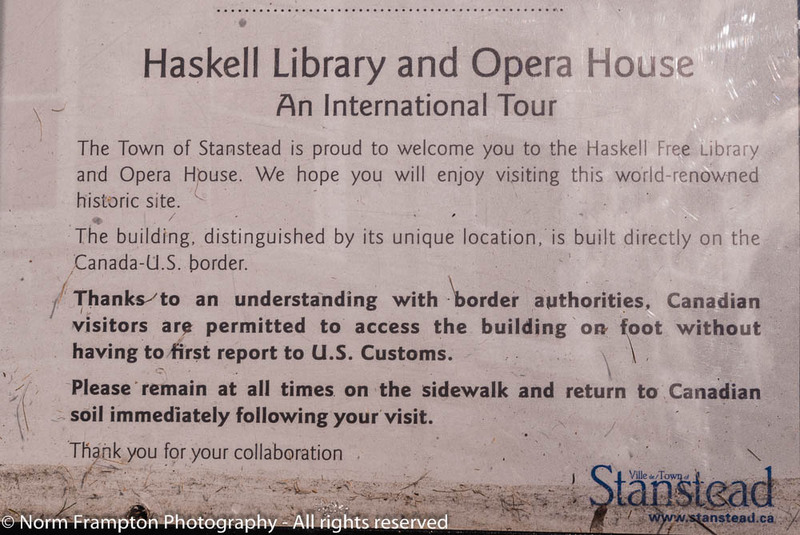 Fortunately townsfolk on both sides of the border were able to petition Canadian and U.S. Customs to make one small exception to the new rules specifically for the Haskell. 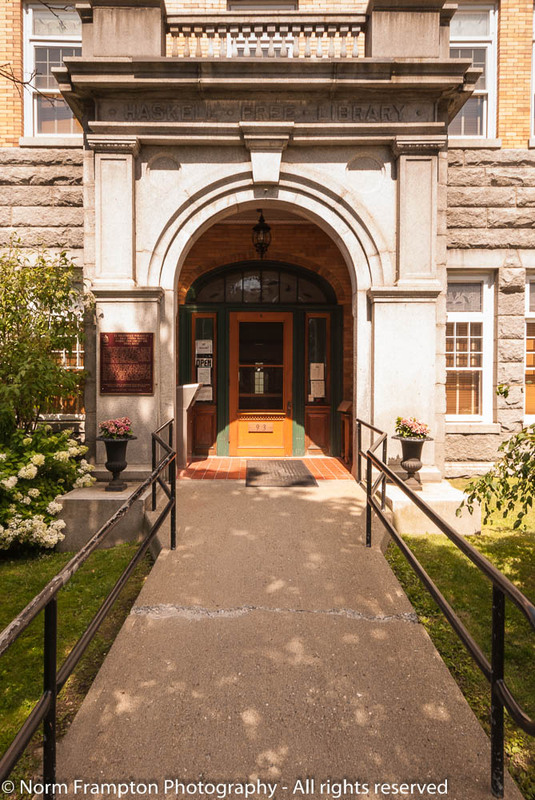 Since the main entrance is on the Vermont side, the rules were relaxed allowing Canadians to cross the border on foot to access the library without having to report to U.S. Customs just to take out a book. Let’s take a look inside and check out some of the doors and other features, shall we? Even the broom closet has a beautiful door! We took advantage of one of the guided tours which are available several times a day for only $5.00 U.S. or Canadian – a 30% bargain for Canadians based on the current exchange rate 😉 – of course all proceeds from the tours go towards the upkeep of the library. After touring the ground floor library which contains over 20,000 volumes in both English and French our guide took us upstairs to see the opera house. Thinking ahead and knowing that new books cost money, Mrs. Haskell had included the opera house in her plan so that the profits from shows could help to finance the library. Can we count this as a door? 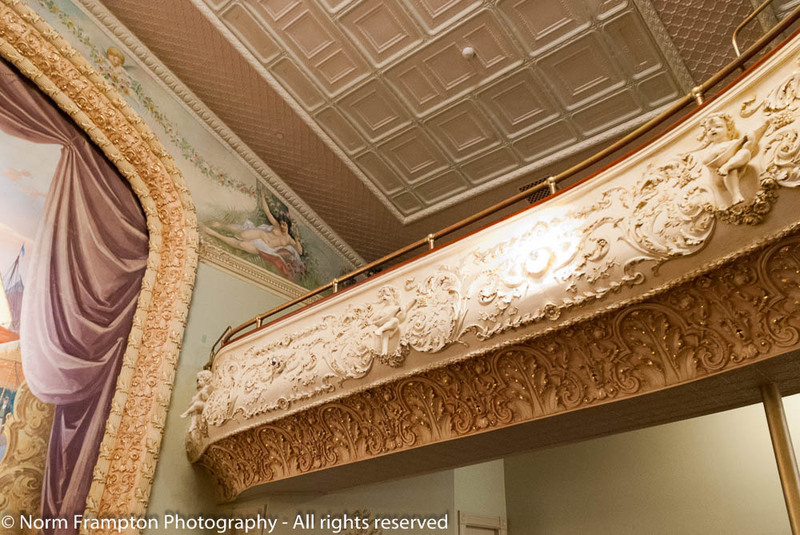 The opera house has a total capacity of 400 on two levels, with hard old wooden not-so-comfy seats for their patrons. Hence the need for this sign I guess? 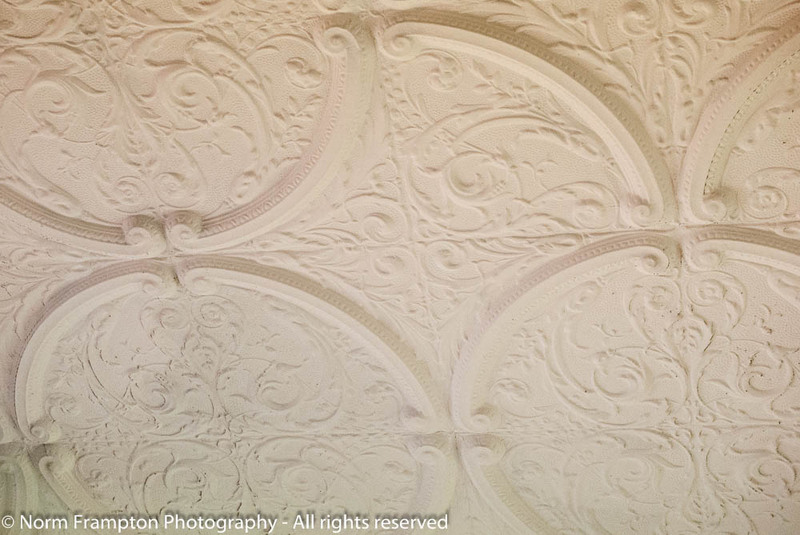 More of those ceiling tiles and some lovely ornate plaster work on the balcony facade. 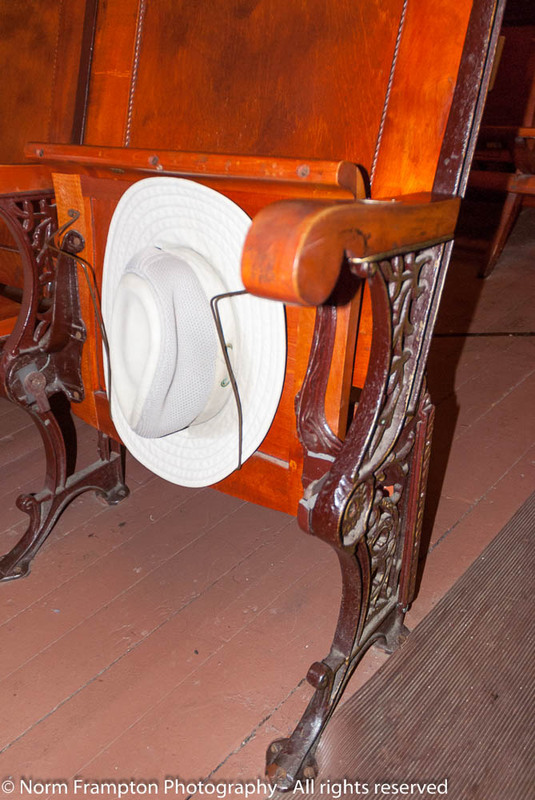 One of the features I found amusing were these under-seat hat holders so that proper gentleman of the day wouldn’t be obstructing the view of the stage for those behind them. Yes, that’s my hat, and no I didn’t forget it there. Another shot of the border – the stage is in Canada while most of the seats are in the U.S. This patron can watch the show with one cheek in each country! 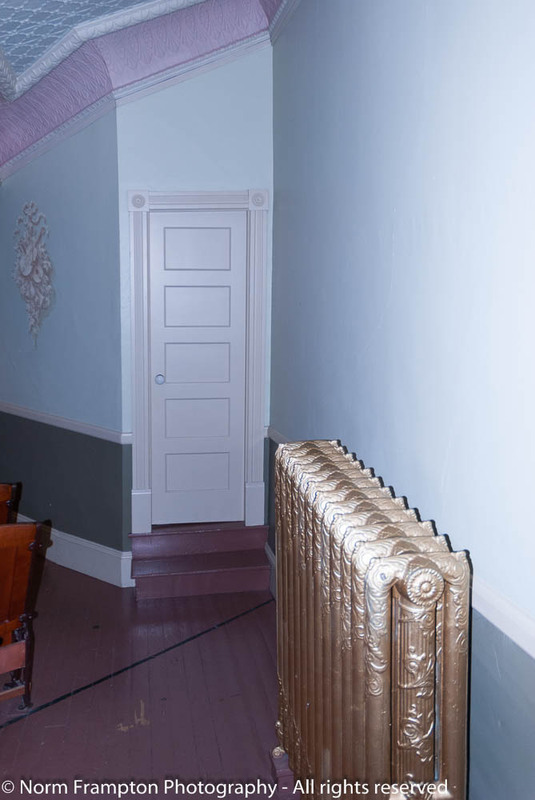 Theatre side exit door – oh my, look at that radiator! Despite this post being a little sparse on gorgeous doors, I do hope you enjoyed the tour as much as did. In fact Honey and I are making plans to go back to the Haskell to check out a show sometime in the fall. 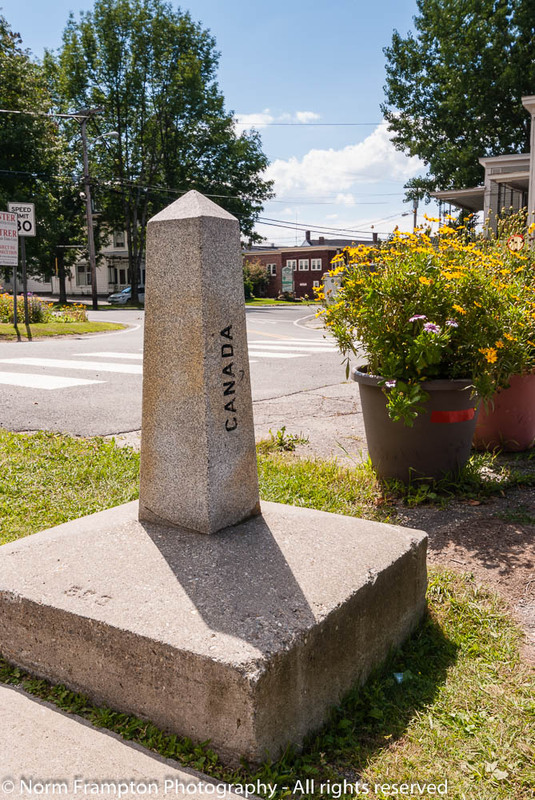 For anyone interested in visiting, the closest highway to the Haskell heading southbound east of Stanstead Quebec, is provincial Autoroute 55 – on the Northbound side, I-91 takes you just east of Derby Line Vermont. On either side, it’s the last exit before the border. If you’d like to read more about the Haskell and its history click on the link to their website back up at the top of this post. 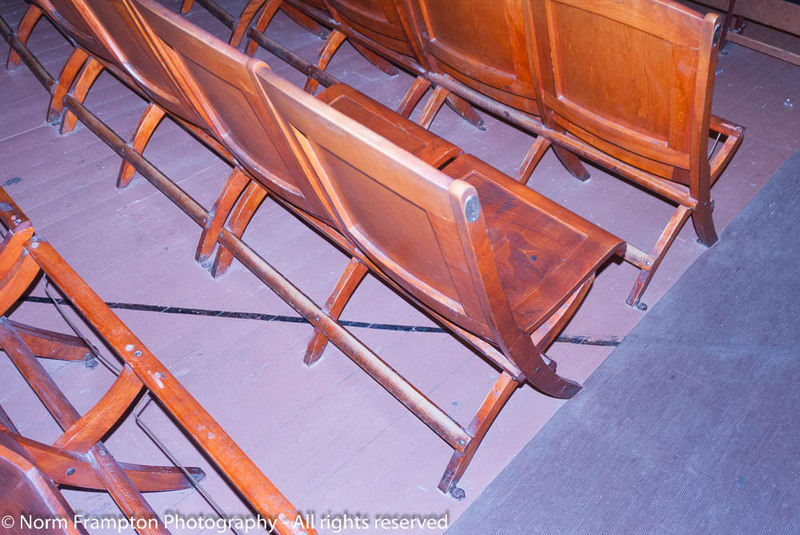 Gallery | This entry was posted in Photography, Thursday Doors and tagged border towns, Canada, Derby Line, Haskell, International borders, Library, Opera House, Québec, Stanstead, USA, Vermont. Bookmark the permalink. What a wonderful, quirky place- Library, Opera house, hat-holders and straddled across two borders…you just have to love someone that went to all that trouble. 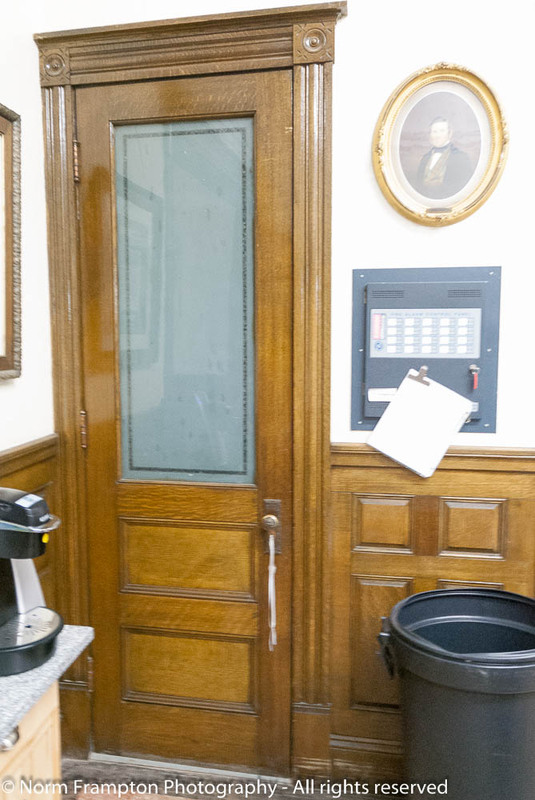 Thank you for sharing such a great post- the broom closet door is highly superior, I hope the brooms are too! What a great place, and wonderful photos! I can see how there may be a border issue and yet, how the need for free flow of people would be needed. Good to know they came up with a solution. The Haskell and it’s woodwork, brass details and cute signs was a marvel, one of a kind story and experience, Norm. I started this comment and fell asleep! It reminded me of how a good old movie would go. Something to leave me dreaming. . . a time where one part of a building was in a country and its neighboring country shared the other half. Like a “make-believe story! Loved this post and it will be a destination spot in my future. . .
Hi Norm. Great doors. By the way just realised I forgot to add my link to your post last week shall I add it to this weeks one instead? Sorry for being so forgetful! Love the ‘cheeky’ seat, and so pleased the authorities showed common sense about the library. Fascinating post, fascinating place . . when I finally make my return Canadian visit I’ll visit here so I can see all the doors (and the line) in person. enjoyed each and every single door ! sharing the interior walk thru was a good idea – and I actually enjoyed the comments so much too – I love when I have the chance to read them for certain posts! You have plenty of time – the link-up is open for entries until noon (North American Eastern Time) on Saturday. Cheers! 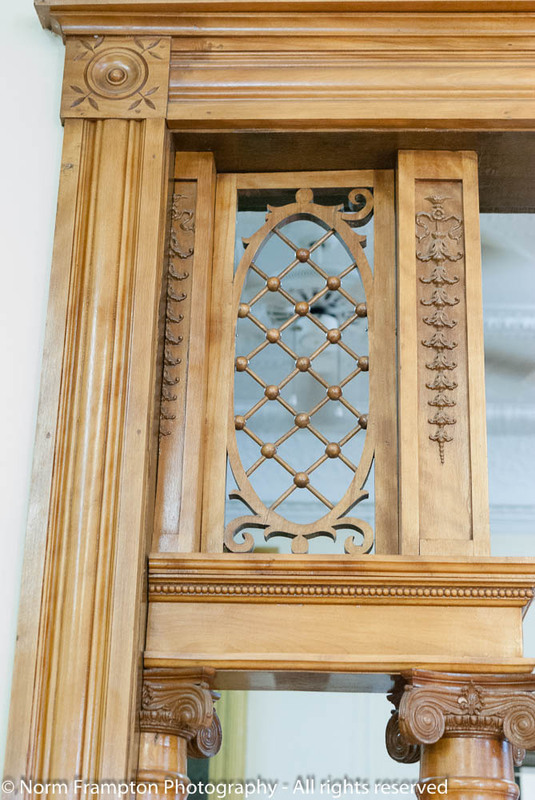 You’re certainly right, such beautiful woodwork. What an interesting place and tour. 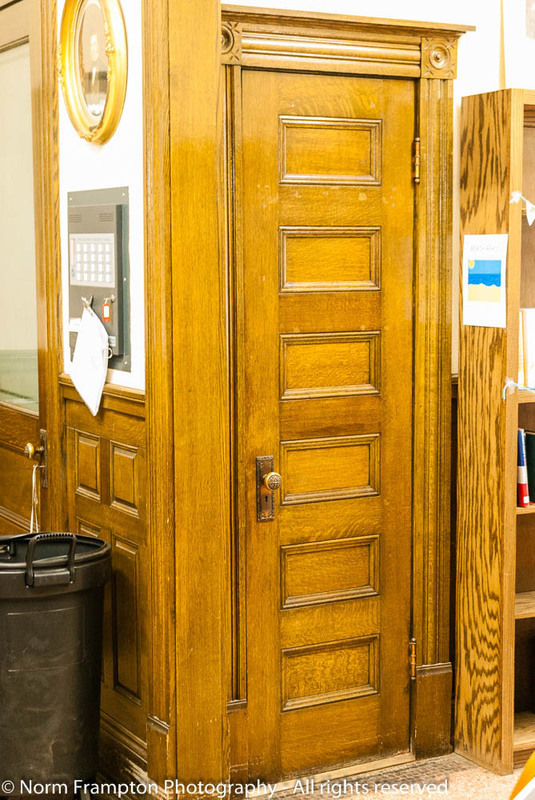 Wow, beautiful woodwork and doors; reminds me of San Francisco’s City Hall when I had my office there at one time. Even better, government officials (Border Patrols) acting in the spirit of good reasoning and judgment to create a good solution to allow “people” not Canadians or Americans to jointly visit this beautiful building/institution. Wish we could have more of this spirit of cooperation in the world. It would be wonderful, but unfortunately it seems that the few who have bad intentions always ruin it for the rest of us. I’ve never seen under-seat hat holders!! 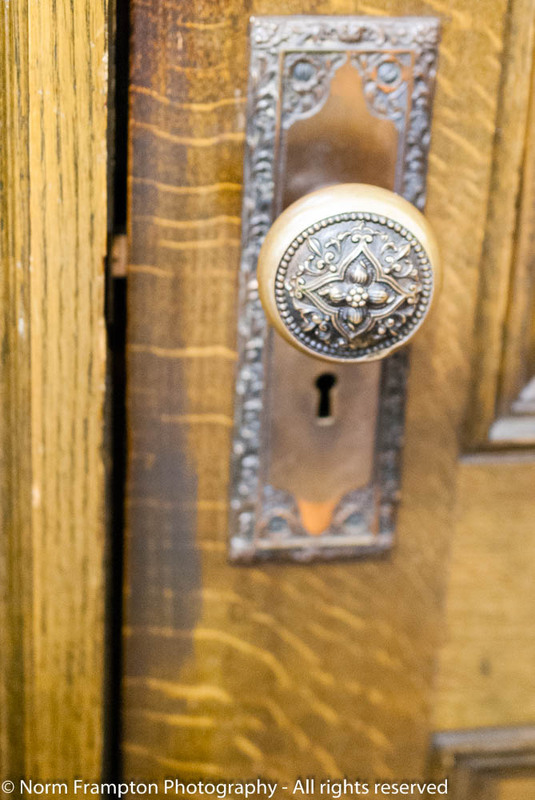 I like the old door knob hardware, too. What a great tour, Norm! Thanks. Love the skinny broom closet door and the under-seat hat holder. I wonder what genius thought of that! Thanks Ruth. I know eh? I had never seen that before but it does make perfect sense that men needed a place to stow their hats. Beautiful building and doors. I would love to see that library and opera house. Great photo’s! And thanks for the history lesson 🙂 Love the picture with the hat! 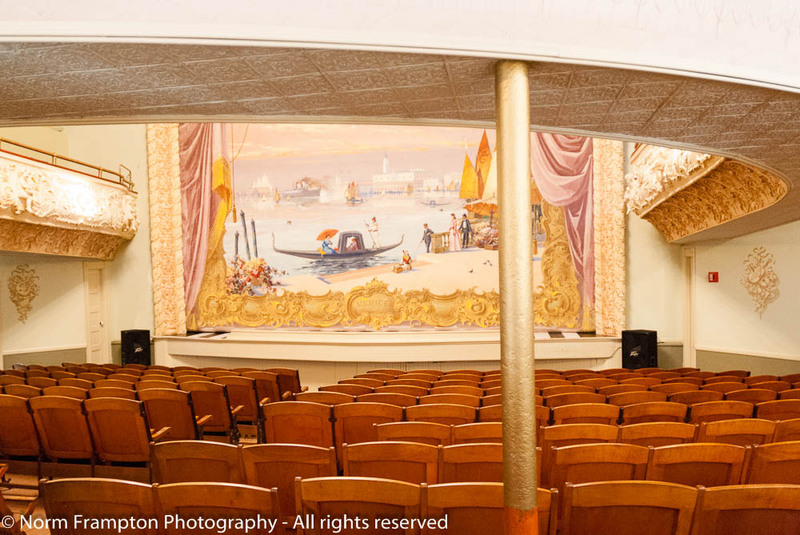 What a wonderful story – and a very cool building. I love the under the seat hat holder. Thanks Jan. The hat holders were something I’d never seen before, but it certainly makes sense, especially since hats were still very much in style back then. 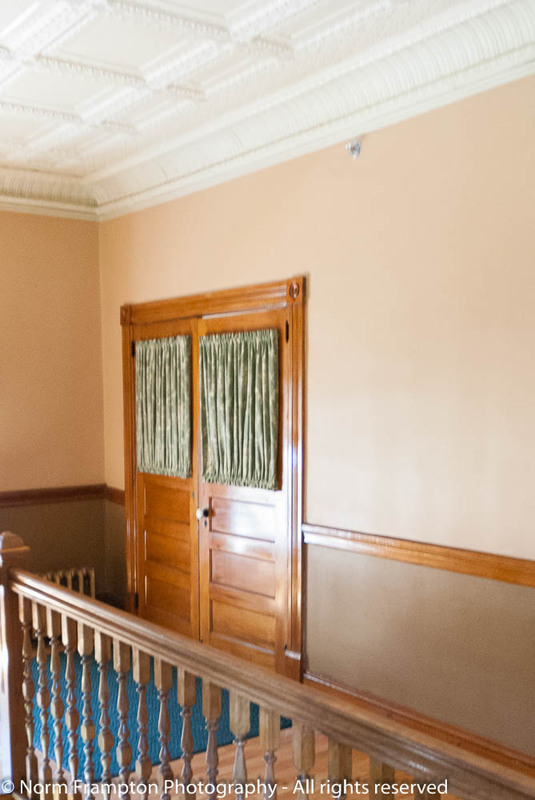 The door knob, the woodwork on that window, the ceilings, mouldings, and doors are superb! I really love the green trim around the front door too. What a gem you found this week! Thank you for the tour, and history about it. I love the wood and woodwork on these old doors. Most of today’s doors are just not as good. Very true, there’s nothing like the beauty of a good old solid wooden door. It has worked for centuries right? Silly question: where is the link-up button for door photos. Thanks. Saw it and was thrilled. Will post today sometime:) Looking forward. I had to laugh at guichet, because I didn’t know this word until I got to Quebec, so here I am 20 years later, “Oh is that how you spell that?” Apparently it’s not just a direction people point to. Haha! Maybe it’s sparse on doors, but you always tell us one will do, sooo…. and hey, the doors you did shoot here are fantastic! I will have that doorknob, yes, please. And may I use the hat holder for my handbag? Thanks Joey. I had a feeling you might like this one. What a great history lesson Norm along with your beautiful photos. My favorite “door” is the ticket window, and I really love the pressed tin ceilings. They have done a wonderful job maintaining this Canadian/America treasure. What a treasure, Norm, and thanks so much for the tour! Any library is wonderful to me, but this one is stellar. 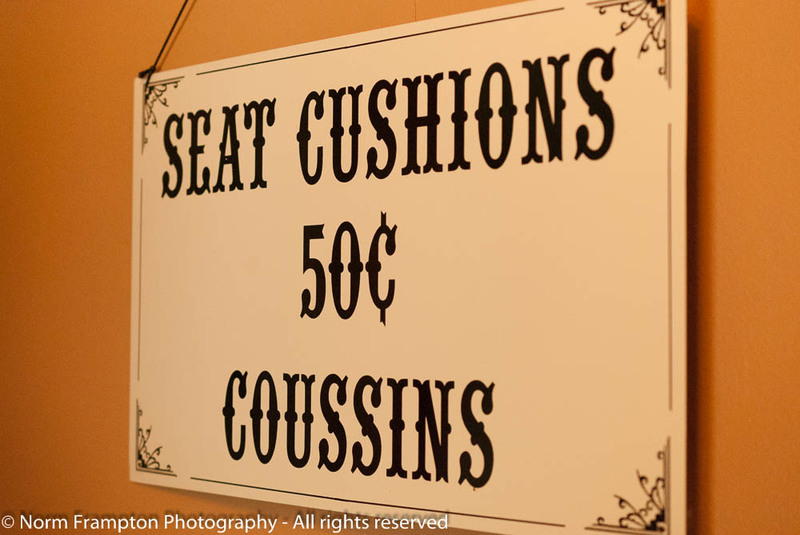 Love the idea and I would definitely sit in a chair that straddled the border. 🙂 While the doors are great, the pressed tin ceiling is what I love. Happy Thursday and may all doors open for you today! Great tour of a very interesting building. I vaguely remember the controversy around this town after 9/11. I can’t imagine how a town council can work under 2 jurisdictions – unless there are 2 town councils. It is nice to see that this lovely old building has been beautifully maintained. Thanks Joanne. I’ve known about this place since long before 9/11 and it was always on my ‘one of these days’ list. We finally got around to it recently and I’m so glad we did – it was a LOT of fun. As far as I know there are two separate town councils, but there is also a joint committee that meets regularly to look at the issues that both sides have in common. When you think about it, that’s rather remarkable. Sometimes a single town council has trouble working together and this town has figured it out with two! 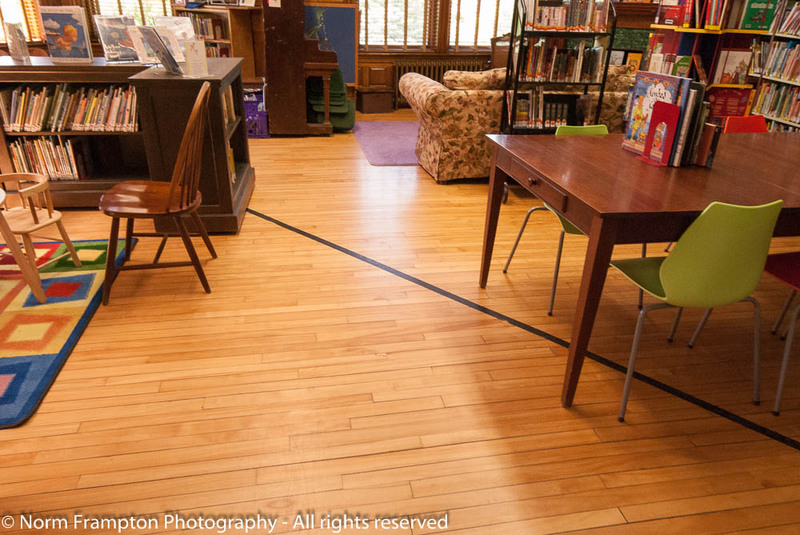 Very cool, a true international library. Warm and fuzzy is exactly how we felt visiting this place Judy. And I was thinking of you the whole time because I knew you’d love it. What a wonderful story, Norm. It seems like a trivial thing, allowing people to walk across the border, but in these times, I can appreciate the significance of that small act. I love the stone building and entrance. 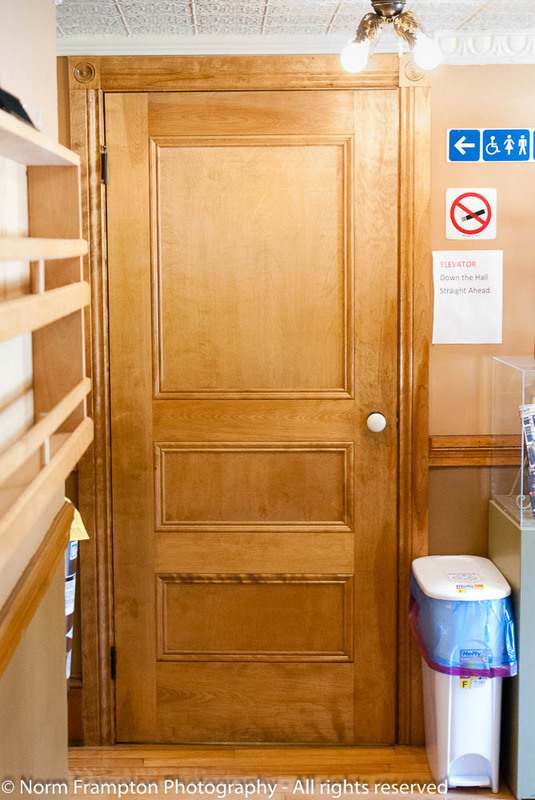 I really like the narrow wooden panel door with the frosted glass. 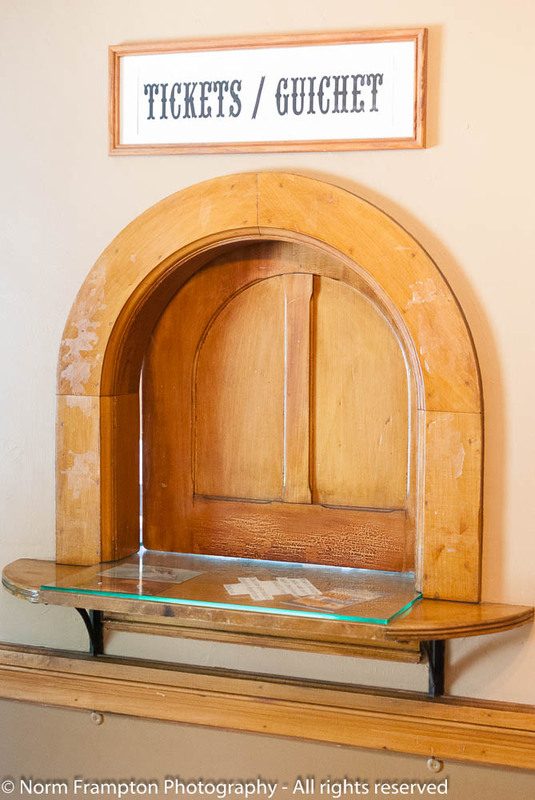 And, the arched ticket window “door” is beautiful! Thanks for including the interior pictures. Oh we had so much fun at this place Dan. After 9/11 it was touch and go for a few years, with a number of non-local politicians demanding that the entire place be shut down for security reasons. Thankfully cooler heads eventually prevailed. What an interesting place to visit, Norm. Love the fact that the building is right on the boarder and it’s good to hear the border patrol has been relaxed. However, that notice still sounds rather strict. Still, it certainly would not spoil the enjoyment of touring this beautiful building. You’re right Hugh, it is very strict. On the American side they can be a little paranoid at times when it comes to national security, but can you blame them after what happened? It’s a sad but necessary sign of the times we live in. By now most people have adjusted to the stricter rules and take it in stride. Not all, Norm. They are doing everything right by keeping the general public safe and that’s how it should be. It’s very good to see it happening.